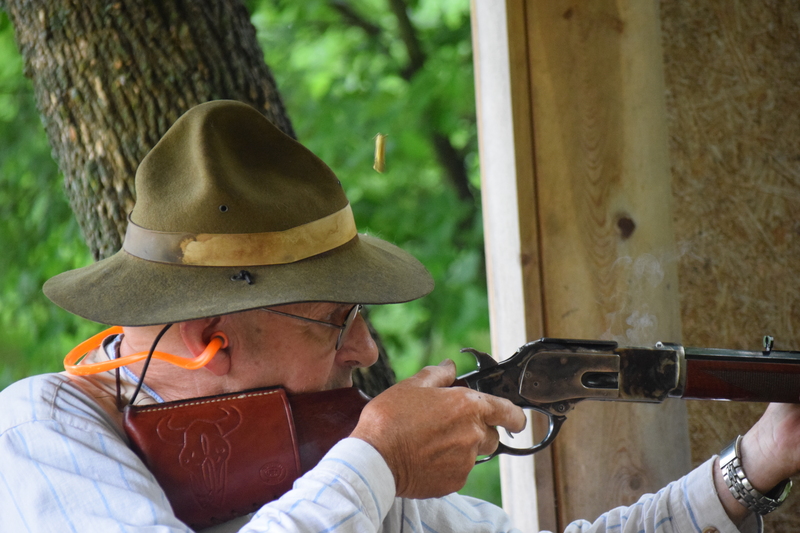 The Free State Rangers Cowboy Action Shooting Club is affiliated with the Single Action Shooting Society (SASS), the National Rifle Assoc (NRA) and the Kansas State Rifle Assoc (KSRA). We encourage everyone to join any or all. Our shooting is all done with firearms, or copies of firearms, made before 1898. Single action centerfire pistols, lever or pump action rifles in pistol calibers and double barrel or Winchester Model 1897 pump shotguns are used by all shooters. Period type of attire is a requirement…no ball caps, athletic shoes or short sleeve shirts. CAS is governed by rules set forth by SASS, with safety being of the utmost importance. Unsafe or improper gun handling is not tolerated and is grounds for disqualification and removal from the range. “Fast Draw” type shooting is prohibited. Shooters are limited to lower powered ammunition, both for safety reasons and to prevent damage to the targets. Although there are a few shooters whose goal is to be the “best”, most shooters are only in the sport for the fun of the shooting and the camaraderie among the participants. A large part of the fun of CAS is the period costuming. The Free State Rangers conduct their shoots on the 1st Sunday and 3rd Saturday of each month, weather permitting. We also shoot on the 5th Sunday, when there is one. And we have a 2 day shoot on the 3rd weekends of May and October. Our range is located 6 miles southwest of Parker, Kansas or 11 miles east of Garnett. We have room for dry camping, both tents and RVs. A very nominal shooting fee is collected to help offset the costs of insurance and range maintenance and improvement. Club membership dues are $30 per year or $40 for a family membership. Members shoot for $5 per event and non-members must pay a daily membership fee of $5 plus the $5 event fee. Yearly dues are for the calendar year. It is strongly recommended that new shooters come out and watch at least one match to familiarize themselves with the rules and procedures. Click Here for the SASS rule book. Any of the officers will be glad to answer any questions you might have.